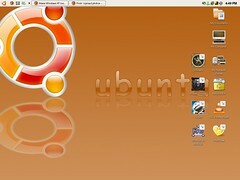 Recently, I’m crazy of Ubuntu Linux – although I haven’t successfully install it to my computer. Then, I was thinking, how about changing the look of my Windows XP desktop to look like a Ubuntu Linux’s desktop? Because what I like most about Ubuntu Linux, is its interface! Google a while, and I found a tutorial from Manas’ blog. A very well-done tutorial is written there. I am not going to show the tutorial here, as you can find the complete and updated tutorial from the original author (click here) All credits go to the person who created all the lovely styles and of course the author of the tutorial.